Rolled cookies are made from stiff, chilled cookie dough rolled out with a rolling pin and cut with a knife, pastry wheel, or cookie cutter. Often cookies are decorated and then baked – or baked, cooled, and frosted. These cookies are sometimes referred to as cut outs (because they are cut) or crisp cookies (because when baked, they are thin and crisp.) The dough is cut into any shape you wish with cookie cutters, such as trees, candy canes, and stars for Christmas; hearts for Valentines Day; shamrocks for St Patrick’s Day; pumpkins for Halloween. You can also cut cookies into circles with a drinking glass or into triangles with just a knife. Sugar cookies and gingerbread men are examples of rolled cookies. Before rolling. Avoid handling the dough too much before rolling it out, since extra mixing and kneading allows gluten in flour to expand, giving cookies a harder, tougher texture. Chill the dough 15-30 minutes before rolling it out. This will prevent the dough from sticking to the rolling pin. If dough is too stiff when removing from the refrigerator, let it sit at room temperature to soften. Dough that is too cold will crack and be difficult to roll. The dough should be chilled, yet pliable enough to roll. When rolling. Roll out just one portion of the dough at a time. Keep the rest of the dough covered in the refrigerator. Rolling out too much dough at once will cause it to soften, making it more difficult to cut cookies and move them onto the baking sheet. Roll the dough from the center out into a circle or rectangle, usually to a 1/8 or ¼ inch thickness. Keep a uniform thickness so the cookies bake evenly. Re-rolling. Save the scraps from cut cookies and create a new ball of dough to roll out. 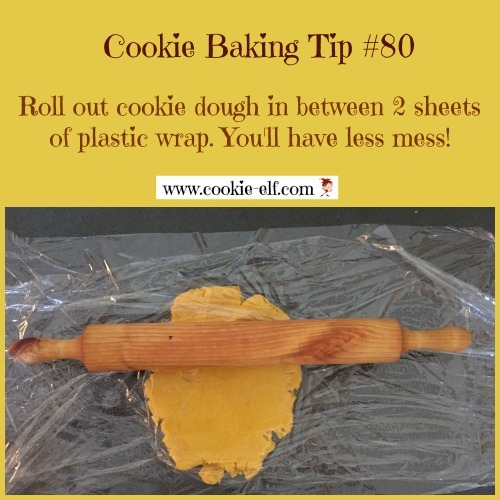 Try these tips to prevent cookie dough from sticking to the rolling pin or the rolling surface. Use a rolling pin cover and pastry cloth to make dough easier to handle. Roll dough between two sheets of parchment paper, freezer paper, or waxed paper, rather on a floured or sugared surface. Remove the top sheet. Cut cookies and lift with a wide spatula from the bottom paper onto pan. Or roll out dough in between to sheets, refrigerate for at least ½ hour, peel off the top piece of paper, and cut cookies. Dip metal cookie cutters in flour or powdered sugar (baking cocoa for chocolate dough) to keep dough from sticking. Tap the cutter before using to remove excess flour. Dip plastic cookie cutters in vegetable oil to get a cleaner edge on cookies and interior patterns. Cut cookies as close together as possible on rolled dough. This helps minimize the number of times you need to re-roll dough scraps, which makes for tougher cookies. Lift cookies to cookie sheet with a wide metal spatula that supports the entire cookie so it doesn't lose shape when transferred from the cutting surface to the baking sheet. Decorate cut rolled cookies with colored sugars, nonpareils, glittery sparkles – or leave them plain and frost them when cooled. Store rolled cookies in a container with a tight-fitting cover.